Train That?” and we didn’t even have time to discuss opening notes. We dove head in to the training. The topic seemed to have everyone’s attention. A lot of behavior issues were discussed and thought through on how to incorporate training to change them. We discussed the use of “targeting” when working with aggressive birds. Targeting is when you get the bird to touch a body part to a desired object on cue. For example, having a bird target a stick could mean you want them to touch the stick with their beak on cue. We discussed how incorporating this training inside the cage gives the trainer a sense of security while learning to read and understand the bird’s body language. 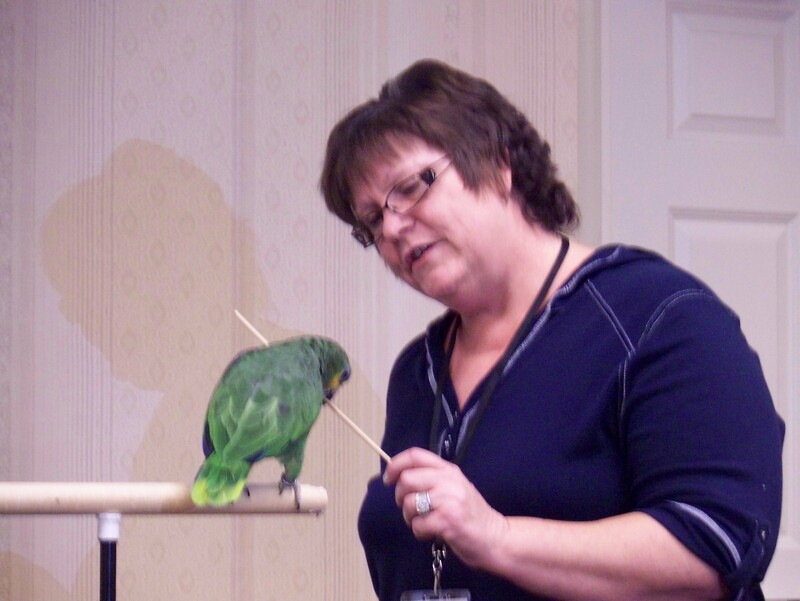 We discussed how positive reinforcement training build relationships between the birds and their owners. We then discussed how once you do get this formerly aggressive bird out of the cage, how target training can be of a major benefit when you grow and learn with your bird outside of the cage. We discussed how to build the list of rewards with your bird such as treats, food, and physical interaction with you bird, like a head scratch. Birds don’t always work for food as many of us have seen this already. Some birds will work for a head scratch, some may work for vocal interaction from another room. Some may work for the head scratch now, and then work for that food treat in another minute or so. Frequency in training is and can be much more effective in changing behavior than the amount of time spent training the bird. We discussed how training sessions can last 30 seconds to a few minutes and how this is so effective to do this several times a day versus sitting down and having one 30 minute training session once a day. We discussed how to begin target training, how to train a bird to go willingly go into its cage, how to work in desensitizing a bird to feared objects and the dangers of forcing a bird to face and give into fears. We discussed working with a bird that prefers another family member and in how to incorporate other family members to safely step in and start training and build that relationship too. We ended the meeting quickly because we ran out of time and actually went over on time, but it sure was fun. The meeting also ended with a comment “You need to have more topics on training.” Training is extremely important and we all do it well, weather we know it or not. With each interaction we have with our bird, we are training. We often train our birds to bite harder, scream louder, and run faster. There is no doubt that we can also train these birds to whistle instead of screaming, running to the towel vs away from it, and dropping an item you don’t want it to have on cue. Also…..we did have a winner of the Foraging Toy Contest. The winner is Karolina Zakonek. Karolina won a $50 gift certificate for toys from Bird Toys by Lara Joseph. She has since shared with us the photos, the toys, and how she incorporated them into her birds’ environments. Her greys, Zuri and Sophie are now eager and learning foragers. Congratulations Karolina. We will make a separate post on her toys, her greys interacting with them, and her opinions on foraging now. See you all next month!!! What a wonderful article full of useful & actionable information! I look forward to more in the future. There really is no better way to develop a good relationship with your parrot than through training. Many people are attracted to these magnificent birds because they want to teach their parrot tricks. I think this is a good thing because it is beneficial for the parrot as well as the owner! Karla, I agree with you 110% in there being no better of a way to develop a relationship with your parrot, than through training. Positive reinforcement training does just that and can change undesired behaviors to desirable behaviors. Individual birds are just that…individuals. Some times it takes longer to work through certain behaviors with one bird than that of another and it can heavily depend on the history of the bird. Thanks for being a part of the blog.